Isaac Asimov once described himself as a “professional explainer,” and this new collection of essays displays the encyclopedic knowledge, the quick wit, and the lucid style that have made him the foremost practitioner of the study of earth and universe. What is the earth’s chemistry? Where does astrology come from? Can any particle travel faster than the speed of light? Dr. Asimov tackles these and other absorbing questions of the day and age. As usual with Asimov’s F&SF essay collections, I like this one a lot. It holds a particular place in my heart because of the introduction—I was very fond of the song “The Age of Aquarius” when I was twelve (having never, of course, actually seen Hair), and in the introduction here the Good Doctor explains very clearly and unforgettably what the Age of Aquarius actually is (although the vernal equinox won’t enter Aquarius for several centuries yet). The title essay is a good debunking of astrology, and is followed reasonably soon by a solid debunking of Immanuel Velikovsky. 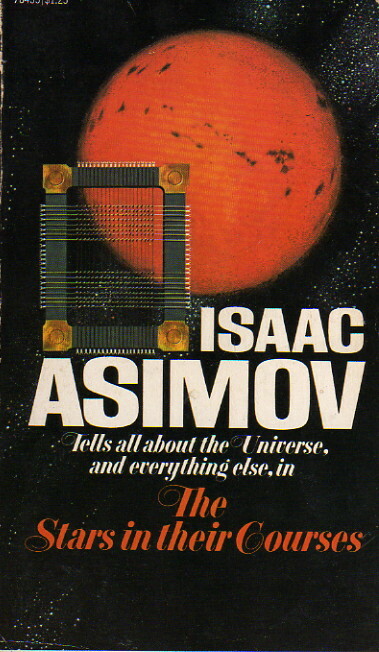 The three essays on gravity, climaxing with “The Man who Massed the Earth” are also very good, and are immediately followed by “The Luxon Wall,” in which Asimov has to defend himself against Arthur C. Clarke (of all people) for asserting so emphatically that one cannot travel faster than light. The final three essays, “The Sin of the Scientist,” “The Power of Progression” and “My Planet, ’Tis of Thee” are also very thought-provoking. The middle one is another warning about population growth, but the other two are subjects Asimov treats less frequently—scientific ethics, and world government. Some of the essays sandwiched between all these are not among Asimov’s more memorable, but the overall average is still high and the book still more than worthwhile.